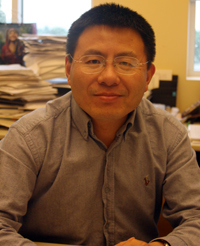 Lei Li is an Assistant Professor of Management at the University of Portland's Pamplin School of Business. He earned his B.S. from Peking University in China, his M.B.A from International University of Japan, and his Ph.D. from the University of Texas at Dallas. He teaches corporate strategy and cross-cultural management at both undergraduate and graduate levels. His research focuses on internationalization strategies and processes of firms. He was previously a strategy consultant with Roland Berger & Partners, a Munich-based international management consulting firm. What is the main focus of your research work? My current research mainly addresses firm international strategies and internationalization processes and, and how various strategies and processes may impact firm performance differently. Initially, I was trying to look across many different industries. In the last year or two, I’ve been trying to examine particular industries, namely the biopharmaceutical and computer equipment industries. Why is it important to study international strategies? Many U.S domestic companies – whether big or small – may wonder if they need to go international, or if they’re ready to go international. For domestic companies, it would be important to learn from the experience of multinational firms, in terms of what kind of strategies they normally adopt. What kinds of internationalization patterns and processes tend to be more successful than others? Learning from the experiences of multinational firms may help with a domestic firm’s international expansion. Multinational companies may want to learn about the kinds of strategies that might be particularly effective in certain industrial contexts. They may ask if there is a better internationalization process. Many would want to know why certain international business ventures falter—This understanding would help them to recognize and adopt more effective internationalization processes. Your management studies have taken you to Japan and the U.K., and your consulting work has taken you to Munich, Germany. What were some of the key cross-cultural learnings from your experiences in those three very different cultures? For my MBA program, I studied both in Japan and in the United Kingdom. The student body was very diverse; we had students from over 30 countries in the program. Looking back to my experience in Japan, I realized that I was not a very good team player at that time. I had conflicts with some of my team members, especially my Japanese teammates. The Japanese are very collectivistic, and they always strive to maintain the esprit de corps – or group spirit. As an example, I made a suggestion at a very early stage for a team project. The group did not follow my suggestion, but my point turned out to be right. I pointed that out to the group, and that comment made one of my Japanese teammates very angry and upset. Later I realized that it’s not really appropriate to say something like that at that point of time, because the comment was too late to make any difference. Even though I was right, I should not have said anything to dampen the group spirit. I lived in Japan for about two years. One summer, I decided to go to Tokyo to experience Japanese life outside of the university. I had a couple of part-time jobs; I worked in a store, helping with packaging products and helping customers find products. I also worked in a Japanese factory for about two weeks. My job was to inspect the quality of cosmetic bottles. From that experience, I could understand why some foreign students, from China, particularly – felt that they were looked down upon by the Japanese. Although I was only there for a short time, I could sense that. I was working there as foreign laborer. Because it’s not a professional job, I could see how people might treat you differently. In the U.K., I began to notice a strong sense of individualism. I stayed with a host family, comprised of a man and woman who had children together but were not married. Coming from my cultural background, that was definitely strange. The couple seemed to want to stay as individuals, and, did not want to form a legal family. Working for the German consulting firm also yielded some cross-cultural lessons. Early on, I made an effort to take the initiative to get in touch with partners in London and Tokyo offices. My goal was to introduce myself and get some collaborations going. I soon received a letter from my own partner in the Munich office stating that it was unusual for me to directly contact international partners. Contacting people outside of your own department (without informing your boss) is not perceived positively. I realized soon afterward the German culture’s emphasis on structure and compartmentalization. Bypassing the structure does not tend to be looked at favorably. People are expected to stay within a structure and follow rules and regulations. What are the best takeaways from the cross-cultural management class that you teach the University of Portland business school? I always tell my students, especially here in the U.S., that the most important takeaway is to develop awareness of your own culture, and awareness of other cultures. Be sensitive to cultural differences. Developing sensitivity to differences and similarities will help you, especially if your job has an international dimension, or requires working with different cultures. Does being bicultural and bilingual help in excelling in international business? Definitely. American managers who are more relationship-oriented or people-oriented tend to be more successful than those who are more task-oriented in their approach. For individuals with language skills and for people who are exposed to more than one culture—whether because of educational background or upbringing – these individuals have more awareness of cross-cultural differences. How do people from outside the United States view the typical American businessperson? The answer certainly varies, depending on the country. Some typical impressions: Americans are friendly, but it’s not easy to develop deep relationships. Americans have a sense of urgency – all the time – and often have a tight schedule. Many people perceive Americans as hardworking, competitive, skillful, competent, assertive, and articulate. In some cases, Americans are perceived to be arrogant. Because of certain U.S. foreign policies, the United States has become less popular in certain regions of the world. In some countries, there seems to be a lot of resentment toward Americans. How can U.S. managers or businesspeople become better prepared to succeed in international business? U.S. Americans fall into two difficult traps. One, their native language is English. Many don’t feel that there is a need to learn a foreign language. The other trap is that the U.S. is such a large marketplace. Many Americans may have perception that they don’t need to go international, because the U.S. market is good enough. For Americans, the need to develop cross-cultural capabilities does not come so naturally. A lot of international challenges faced by Americans doing business abroad are due to lack of preparation and lack of awareness. Americans can become successful if they are sincerely interested in cultural differences and the diversity of countries. I would advise that U.S. managers and business people learn the local language – not simply a few words. Make an extra effort to speak the local language. Develop an awareness and sensitivity to the culture. This will help a lot in conducting international business. Make an effort to learn as much about the country you’ll be doing business in. If you know the history of a certain culture, you will tend to have a better understanding of how to operate in that culture. Whether they’re aware of it or not, Americans tend to show ethnocentric behavior, and there are good reasons for this. The United States is the most advanced country in the world. Often, it is the Americans who go to another country to teach the locals about a certain technology, a certain technique, and how to manage a business. However, to enhance effectiveness, Americans also need to be ready to learn from local people as well. Be humble. There are plenty things you can learn, and it’s important to be humble and open-minded. While you may have the technology, technique, hard skills, and experience in other areas if you stay open-minded, it may be a lot easier to find synergies. You may find that combining your approach and the local approach will yield some amazing end-result that you probably never thought of. "For individuals with language skills and for people who are exposed to more than one culture—whether because of educational background or upbringing – these individuals have more awareness of cross-cultural differences." "For Americans, the need to develop cross-cultural capabilities does not come so naturally. A lot of international challenges faced by Americans doing business abroad are due to lack of preparation and lack of awareness." "Make an effort to learn as much about the country you’ll be doing business in. If you know the history of a certain culture, you will tend to have a better understanding of how to operate in that culture."